After we had left Theipval we drove a short distance to The Sunken Lane. This is a place both me and my Dad wanted to visit, on account of the below footage and the story that goes with it. The men in this short, silent film had been insitu for the whole of the night before. 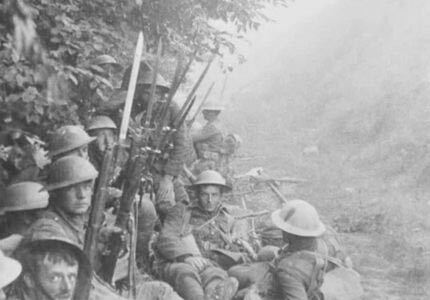 The date was the 1st July 1916, the first, horrific day of The Battle of the Somme. I believe none of them returned alive. They would have heard the colossal explosion of the nearby Hawthorn Mine and then made their way down this very path. The fact that it remains unchanged, despite the carnage that was occurring nearby, was mind blowing to me. And although it is a quiet out-of-the-way place, the atmosphere is full. It felt almost overcrowded in some way. We kept looking for a place to sit and have a contemplative smoke but each spot we decided on seemed to be "taken". That's the only way I can describe it. So we ended going further and further up the lane, until we felt "out of the way". That feeling still makes me shiver a little when I think about it. Just at the end of the lane, across the way, is the site of the Hawthorn Mine. Now on private land, belonging to a gentleman who can sometimes greet persistent visitors with a gruff "Oui" and a nod to allow them access or alternatively, a shotgun and a resounding "NON! ", we decided to view from afar. 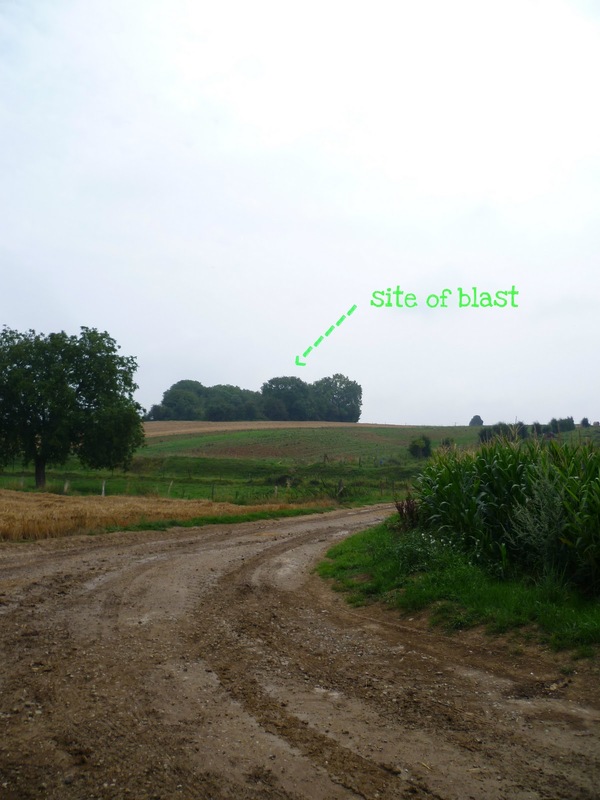 To be honest - I am not sure I would have wanted to be any closer to where such a huge explosion happened. If you want to see just how huge it was - click here. From here we got back in the car (there was a lot of this you will have noticed) and went to visit the Sheffield Memorial. Dad and I came here last year on the 1st July, after attending a morning service at Theipval. When we arrived, I noticed how silent it was. There was a breeze, but no birdsong. This creeped me out a tad, being a gal who believes in things like spirits and echos. What made me a little more on edge was the feeling I got when I was there. I could literally not force myself to go any further than the top of the slope. I felt sick. I felt anxious. I wanted to run. This year, in the company of The Beard, Ma and my Dad, I forced myself to go a little further towards where the trench would have been at the bottom. I will admit, I expressed a bit of false bravado in the manner of saying out loud "I can do this.. I can.. I can...". I felt like I was walking through clay. I physically could not make myself move forward. The anxiety I felt made my heart race. I turned and bolted back past the line of my nearest and dearest who were walking behind me, now saying out loud "No.. no.. no.. f*ck that.. NO!" The whole area at the bottom of the slope feels saturated with fear to me. Saturated. 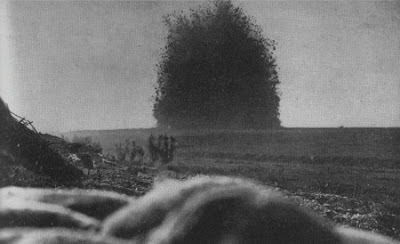 I am in no doubt that the men who were stationed there and who then had to make there way up the hill and over the top in lines of 10 or 12, only to be greeted by German gunfire, have left their echo's behind. So, I sat and waited for the others to return from visiting the cemetery and then we all headed to another one just across the way. The thing that struck me about it, is although this is, once more, in the middle of a working field, there is a lush and green pathway leading to it. And that the flowers were all yellow roses. A bit of a silent weep, and yep, back in the car. Off to the Canadian Beaumont-Hamel Newfoundland Memorial. As you can see, by this point in the day, I am weary. My hair has turned into, frankly, a mess. It was so humid on that day that a makeshift plait was the only solution. I was also still feeling rather heavesome from my breakfast fail. The only redeeming feature of this pic is that I am sans foundation or powder. My skin does not look like this in the UK. Ever. Beaumont Hamel is similar to Vimy Ridge in so much as it has been left. You can still see where the trenches would have been out in the fields, and there are some that you can walk through. It is a huge site and incredibly peaceful. Last year, we only walked down this far on account of the searing heat (check out that blue sky!) 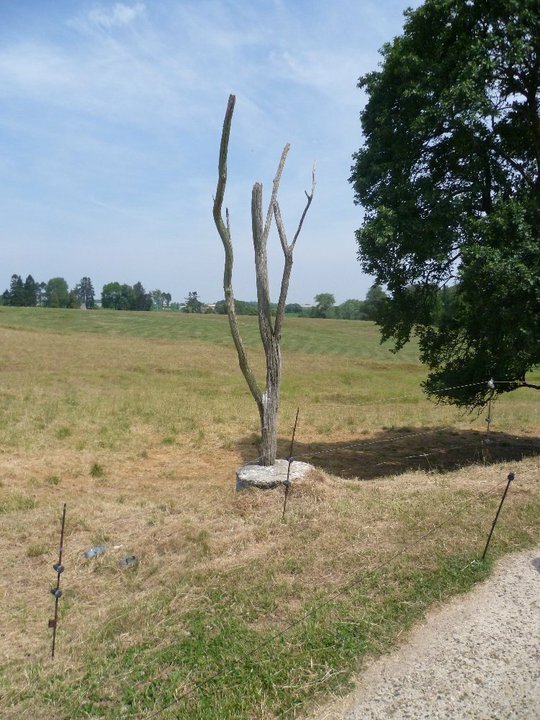 This is known as Danger Tree, on account of it being a German sniper target that many men could not get past without being hit. This year, it was cooler and so we walked round the whole place and I am pleased that we did, because we got to see the German Trench above. It may be calm and serene now, but at the time it would have been a hive of activity. Before we headed back to the hotel, we cooled off in the fab visitors centre at the entrance to the site. I loved the lay out, the concise and personal accounts, the replica Newfoundland cabin which many of the men would have left far behind them at home and especially the ghostly images that are stuck strategically to the window. I also loved the way they display personal artifacts. There was something very poignant about the hands passing the postcards. What you see before you in the remnants of one of the most expensive do-it-yourself-it'll-be-cheaper-than-the-hotel meals I have ever had. The offensive component is not in the photo, as by this point it had been sealed into a tomb of plastic bag awaiting a burial at bin- but I swear I can still taste it. You must be wondering what the chuff I am on about? And thus ended Day Deux. I hope you are enjoying these post's people. I know that they are a lot longer than my usual ramblings, but we did so much on our trip - I don't want to miss anything out. oi! stop that eye rolling at the back! Another fascinating read. I know very little about the experience German soldiers had in the First World War - I think because WW2 overshadowed everything, it just isn't really talked about that much in Germany. I found out that my mum spent her summers in France as a teenager/ young woman, either with scouts or another organisation, helping out on the cemetaries cleaning and repairing graves (any graves, regardelss of nationality). Must find out more from her! Too long? Not at all, I could read them for hours! This is all fascinating stuff and emotionally charged. I am totally with you on the 'feelings' you experienced. Can't wait for Part 3. This is such a great series of posts. I recently studied WWI in two of my history courses and I'm incredibly fascinated by it...the destruction is absolutely heartbreaking. 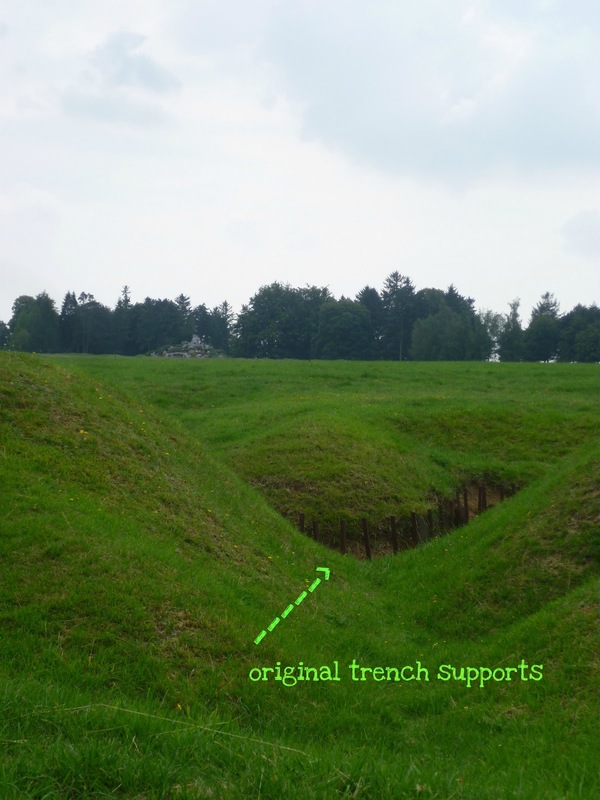 I hope to be able to travel to France someday to see the trenches. I can't wait for Part Trois! Firstly, I laughed ('made my arse go numb') then I thought 'what a busy gal you are' then I thought yep, can totally relate to that spooky thang. I honestly believe that were there has been strong human emotion, some kind of footprint is left behind. I have experienced it myself on a few occasions. I agree with Mary, this is such a great series. I'm particularly fascinated by the hands passing the postcards. You're right, it's very poignant and much more personal than just displaying them laying flat or propped up. It reminds us there are humans behind those words. Thanks for sharing! I really love the history in your posts. This is such a moving account of your trip as well as being thought-provoking AND rather shivery. The image of the hands passing the postcards is very haunting. I know what you mean about that feeling, I've had these experiences myself, not nice. That place must be full of restless ghosts. Heartbreaking. They're not too long at all, I'd rather blog posts with some substance to them rather than flim-flammery about 'oh look, the nice people at random crap.com sent me some random crap to review' or 'Today I'm loving hot chocolate' or whatever. (usually anyway, occasionally flim-flam is what's needed). Anyway, I'm very interested in your experience with feeling the fear left behind - must have been most unnerving. The photos are so moving - particularly the one where you indicate where the bomb blast took place, and the one showing the trenches. On a lighter note, I too have done that - bought loads of stuff thinking "this will be cheaper and better" than a hotel meal only to find my purchases have metamorphosed into a bag of rubbish by the time I'm back in my room!